W.I.C. nail polishes are available in the Herôme online shop for €7.50 per bottle of 0.7ml/0.2 fl.oz., or €12.50 for two. Shipping is worldwide. The product in this post was sent to me for review. This does not influence my opinion on the reviewed product. I love this blue shade! Mooi he, veel werk aan de tribal denk ik. Mooie combinatie van kleuren. Love the nailart, and the color is very pretty too! love this tribal/aztec style art,simple yet effective. Ooo I love this design! It reminds me of my new top from American apparel it's called "Russian circus"
Love it! Love what you did here. Love the color combos and design. You def have great sense of creativity. Great job! Just a tiny voice to say I miss your posts! I hope all is well and it's just that your life is full of adventures right now. Just a tiny voice to say I miss your posts! I hope all is well and it's just that you life is full of good adventures right now! I love doing my own nails, and im always looking for something new to try. This is one that i am going to have to try for myself. It is so cool and love the color so much. I think i could pull this one off. We miss you! Please come back! hope everything is well jane! i miss seeing your creations! where are you hun? hope your back soon! Your nail desings are awesome!! How do you learn how to do som many?!?!?! Hey dear, no postings anymore :( ? Lovely color! And the nail art you made is also really nice! 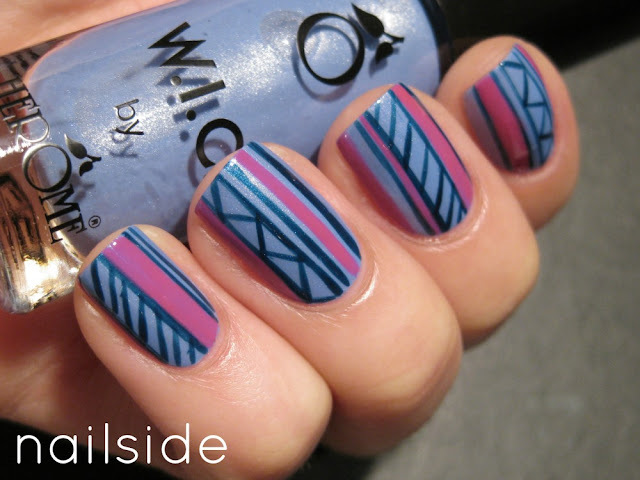 Tribal is such a cute pattern and pink was the perfect accent color! Your nail paints are so beautiful. Fabulous nails! You have great designs and great ideas. Oh Jane! I wish you would come back! AWW come back your posts are amazing! I like those colours pretty mutch! Nice, really nice! This is not fair. I just found your blog only to find out that something has made you disappear. Well your nail designs are stunning and I do hope your are well and happy wherever you are. can you please tell me why did she disappear?